The Reel Roundup | Everything Movies & More: Win Passes to an Advance Screening of SHAZAM! Just say the word. Advance screenings of SHAZAM! are taking place April 3rd in Vancouver, Montreal (English and French), Ottawa, Winnipeg, Calgary, Edmonton and Halifax, and you could win passes! We all have a superhero inside us, it just takes a bit of magic to bring it out. In Billy Batson’s case, by shouting out one word—SHAZAM!—this streetwise 14-year-old foster kid can turn into the adult Super Hero Shazam, courtesy of an ancient wizard. Still a kid at heart—inside a ripped, godlike body—Shazam revels in this adult version of himself by doing what any teen would do with superpowers: have fun with them! Can he fly? Does he have X-ray vision? Can he shoot lightning out of his hands? Can he skip his social studies test? Shazam sets out to test the limits of his abilities with the joyful recklessness of a child. But he’ll need to master these powers quickly in order to fight the deadly forces of evil controlled by Dr. Thaddeus Sivana. David F. Sandberg (“Annabelle: Creation”) directs New Line Cinema’s “Shazam!,” the origin story that stars Zachary Levi (TV’s “Chuck”) as the titular DC Super Hero, along with Mark Strong (the “Kingsman” movies) in the role of Super-Villain Dr. Thaddeus Sivana, and Asher Angel (TV’s “Andi Mack”) as Billy Batson. “Shazam!” also stars Jack Dylan Grazer (“IT”) as Billy’s best friend and ultimate superhero enthusiast, Freddy. SHAZAM! is in theatres April 5th, 2019. There are a total of three (3) different ways to enter this contest. Enter via all three methods to maximize your chances of winning! Via Twitter: FOLLOW our Twitter page, RETWEET the Twitter contest post & REPLY to it to indicate which city (and language, if applicable) you are entering for. Click here to enter. Via Facebook: LIKE & FOLLOW our Facebook page and leave a COMMENT on the Facebook contest post to correctly name the actors who play Billy Batson and his alter ego Shazam. Also, don't forget to mention which city (and language, if applicable) you are entering for. Click here to enter. 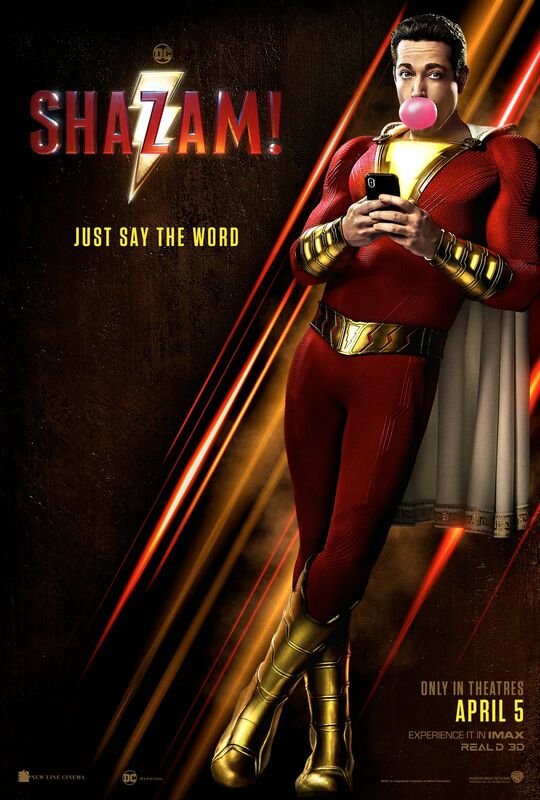 Via Email: EMAIL thereelroundup@gmail.com using the subject line 'Enter Me to Win Passes to see SHAZAM! ', and provide your full name and email address in the body of the email, as well as the city (and language, if applicable) you are entering for. Contest open to legal residents of Canada aged 18 years or older at the time of entry, and closes Friday, March 29, 2019 at 11:59 PM Eastern Time. One prize per household. Odds of winning are dependent on the total number of entries received. Winner(s) will be selected at random, and will be contacted via Twitter direct message, Facebook message or email, depending on the method(s) of entry. Should a winner be disqualified or fail to respond in a timely manner in cases where further information is required from him/her to redeem the prize, The Reel Roundup™ reserves the right to draw another winner in his/her place. By participating in this contest, all entrants agree to be bound by these rules and regulations. The Reel Roundup™ accepts no legal liability in relation to the operation of this contest.